Nice is Nice: Such a lovely shade of lavender, don't you think? Turquoise and Caicos: I have been wearing this one all winter, its almost a spot on Tiffany Blue, and oh so fun. Flawless: Slightly more muted than the photo shows, I picked this one up at J.Crew. It's feminine and flirty, and I can't wait to wear it. 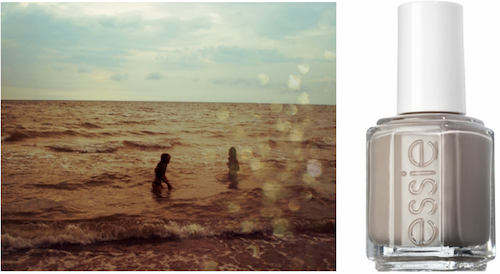 Sand Tropez: This color has been all the rage lately in the form of Chanel's Particulière. I wore this color during most of my stay in Europe, and adored it. It's the perfect shade for any ensemble. Coat Azure: For the days when you're feeling "blue"! What is you're favorite shade for spring? I'm getting a manicure today - glad to see this post beforehand! I wore Lilacism on my wedding day, I love it so much. ohhh! I love the purple! I love a pretty manicure too, speaking of which I need one! Have a good day! So pretty and springy! Brightens up this gloomy winter day. Thanks Keely! Thank you for being soooo helpful! I love that rug and I Love your blog. gorgeous palette! i think i need the sand tropez to get me through tax season. I'm dying to try Turquoise and Caicos. I can see it looking amazing with a short, chic manicure. Love it! Love this adorable post! Thinking I am in desperate need of a mani...stat! PS - I got a pedicure yesterday, they didn't have sand tropez but I did choose the most similar color to it (although now I can't remember the name!) and I love it. I like the light on my toes, it's perfect even though I won't be showing it off to anyone other than my husband!